Nike’s adoption of Facebook Messenger’s new AR platform allowed them to sell out in less than an hour. It’s an exciting idea on how to visualize products in the real world for online shopping, and one of the first successes for Facebook. According to WWD, AR is expected to inject $122 billion into eCommerce by 2020, though increasingly there are questions regarding mobile’s value in-store vs bringing AR and digital naturally into brick-and-mortar stores with embedded kiosks. Aldo recently brought in AR to help make trying on shoes easier and Target brought AR into retail beauty kiosks using Perch partner, YouCam while marrying it with a new text messaging service and a new beauty service (we announced Walmart’s plan to add service last week). Macy’s also is making big investments in revamping beauty to compete with Sephora and Saks made a big bet on upping their beauty game with more spa-like services, but putting beauty on the second floor. Instagram shoppable posts will be a major win for the retail industry, as the platform advances to compete with the sales influence of Pinterest. This is a nice post in Adweek on the new shoppable platform and deciding whether it’s right for your brand. M.Gemi is also going big on Instagram, focused on Instagram Live, and seeing increased success. Now when will shoppable video become real? Walmart is curtailing its mobile Scan-and-Go payments technology in-store, as they struggled to get customers to adopt the app and use their mobile devices in-store. Increasing frictions in-store is not a formula for success and many retailers question whether they really want to drive people to their phones while in-store. Marketing is best done seamlessly in the shopper journey, but integrating it in-store naturally. At the same time, Macy’s said its expanding similar scan, pay and go technology (and adopting AR/VR in furniture departments). Starbuck still reigns supreme in mobile payment adoption. 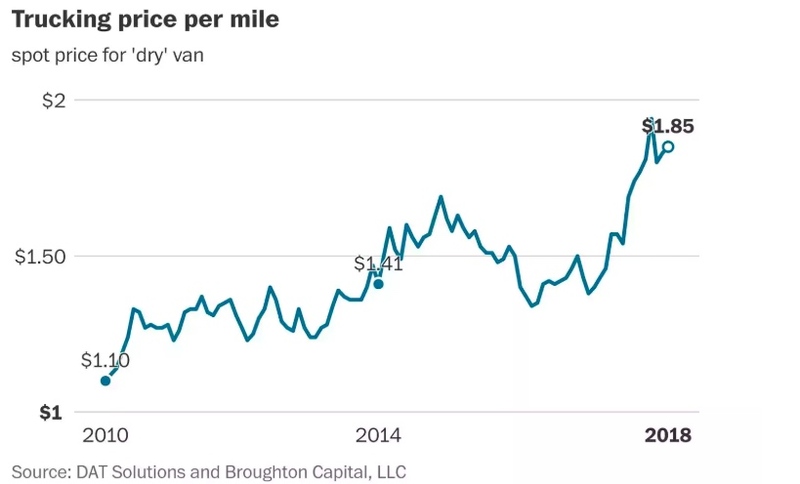 The US has a shortage of 51,000 truckers as transportation needs increase, raising prices from $1.10 per mile in 2010 to $1.85 now. This has a big impact on the economy, where a 10% increase in shipping rates drives a 1% increase in inflation. Self-driving trucks will relieve the supply shortage but may not hit 60,000 until 2035. Meanwhile, President Trump asked the post office to double the rates on Amazon, in a personal vendetta against Bezos. Retail investment in technology is growing 4-5% YoY with in-store reinvention being a key concern, according to RIS's report, as the mandate for digital transformation accelerates in urgency. The report goes through what leaders are prioritizing, especially among the bigger spenders. Lowe’s stock rose 9% with upbeat guidance despite a miss on revenue and profits. They just poached the CEO of JC Penny, whose stock reacted with a 7% drop of its own to the news, while analysts processed how negative a sign this was for the department store category. But don’t tell Macy’s, who “crushed” earnings, with 8.7% YoY growth and thinks it has a “winning formula” for the future. Nordstrom also reiterated it does not expect large-scale store closings. Will they weather their current storm while trying to escape the public market’s scrutiny? Meanwhile, Kohl’s beat revenue, earnings and same store sales estimates while increasing guidance. Their success is being attributed to better courting millennials, while their partnership with Amazon for pickup and returns contributed to greater traffic and is a program that likely will expand. Pier 1 imports is still trying to find their silver bullet, and just was downgraded. You have to move faster in retail. Trade concerns with China weigh heavy on the retail industry, even causing ships to U-turn multiple times mid-shipment. Uncertainty never helps the market in making long-term investments. Whole Foods ended its loyalty rewards program while Amazon beefed up the benefits for Prime membership at the grocer. There is a massive undertaking to rework their entire tech stack, which has hit some pretty big snags along the way. Macy’s also made significant updates to its loyalty program, opening up to more people while expanding benefits. Ulta has seen strength in its loyalty program with 29 million members and just cracked the Fortune 500 for the first time. Unauthorized eCommerce transactions rose a staggering 33% last year. Ouch! With a focus on omnichannel ordering, retailers like Modell’s are prioritizing a mandate to update their POS systems. Shoplifters beware: Facial recognition is being used by retailers to identify thieves, while meanwhile the ACLU is asking Amazon not to share its facial recognition tech with the police. Can we avoid a future without public anonymity? Can Walmart really compete in fashion? A great post by Business of Fashion. Is it smart to partner with Amazon in retail? Early successes make a good case.